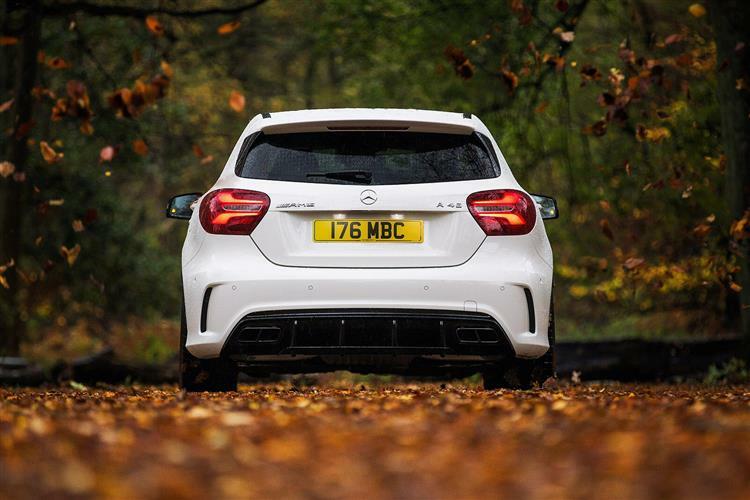 With all-wheel drive and a massive turbo punch, the A45 AMG is the hot hatch giant killer that followers of Mercedes-Benz had long been waiting for. If you want a devastatingly quick hatchback that can do it all, this is where you should start your search. Just how far can you take a hot hatch? In terms of price? Performance? Traction? Quality? It's an interesting question. 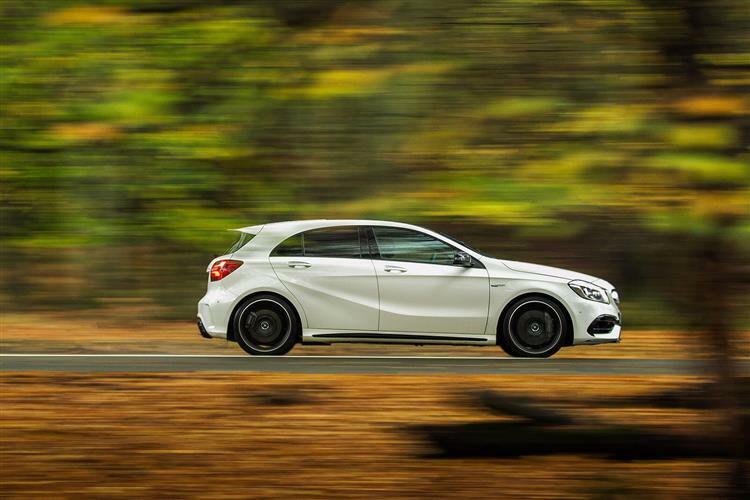 In 2013, Mercedes tried to provide us with a definitive answer in this A45 AMG model. There had back then never been a Mercedes quite like this one. 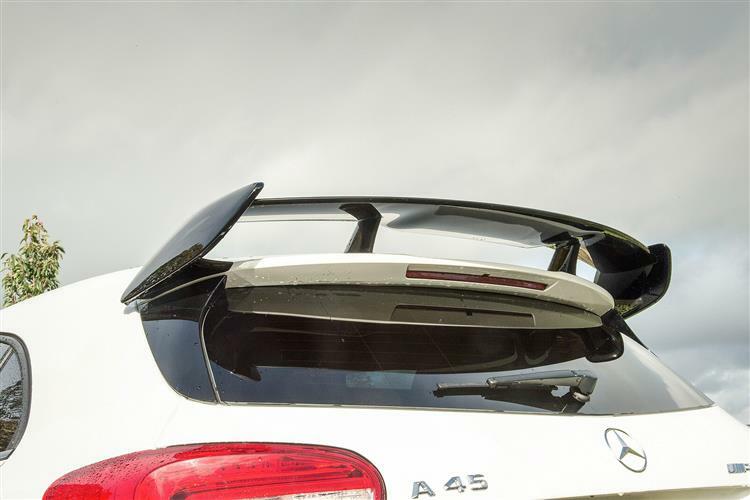 The Stuttgart brand's AMG performance division had never previously built a hot hatch - and never previously breathed upon engines as small as four cylinders in size. 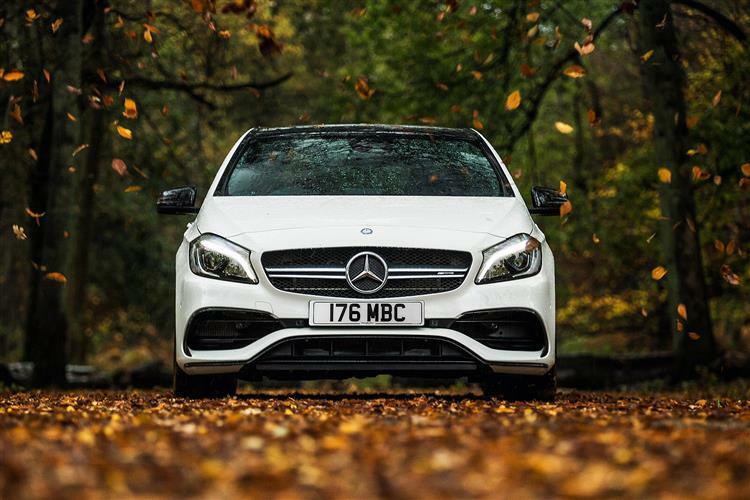 Historically, it had never seriously dabbled with the brand's most compact A-Class model either, a car about as sporty as a couch potato in its first two generations of life - but very different in this form. 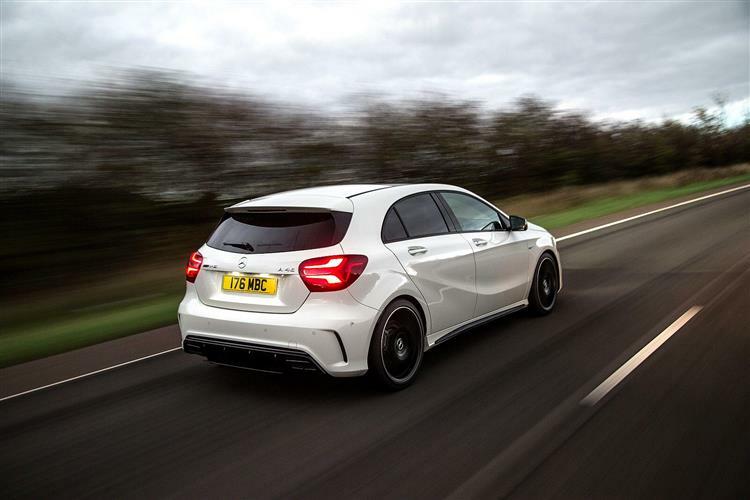 The MK3 model had a more dynamic DNA from the very start: this A45 was intended to be the ultimate expression of what it could offer, launched in mid-2013 and aimed at a far younger breed of customer from the AMG norm. An audience impressed by the fact that beneath the sculpted bonnet lay a hand-built 360bhp 2.0-litre turbo unit billed as the world's most powerful four cylinder engine in series production. With 450Nm of torque transmitted to the tarmac via a 4MATIC 4WD system, it threw down a challenge that was tough for the opposition to answer. The car was lightly facelifted in 2015, when it gained 'Mercedes-AMG' branding and an uprated 381bhp version of its 2.0-litre engine. This car sold until early 2018. 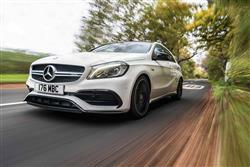 The styling updates that differentiate the A45 AMG from lesser 'AMG'-trimmed A-Class models are actually quite subtle. Too subtle perhaps. So you've got to know what you're looking for in recognising this car. Let us point out some of the highlights. Like the 'twin blade' radiator grille and the cross strut in the front apron, both painted in matt titanium grey. Or the black 'flics' that surround the large cooling air intakes at the sides. They're needed too, for quite an engine lies under the bonnet. No, it wasn't fashioned alongside the big V8s created at AMG's Affalterbach headquarters but like them, it was still hand-built in tune with the company's 'one man, one engine' philosophy on a dedicated production line, this one in Mercedes Kolleda engine plant. You know that because the signature of the engine fitter can be found on a beautiful little plaque on the side of the engine. A lovely touch. And there are plenty of others as you move towards the rear of the car. Like the 18-inch twin-spoke light-alloy wheels which can feature bright red brake callipers. Then there are the AMG side sill panels with their matt titanium grey inserts, a colour also used to trim the rear apron with its highlighted air outlet side openings and diffuser insert. The sports exhaust system's two square, chrome-plated tailpipes are the final things that drivers of lesser cars will see as you flash past. Step across the lovely illuminated AMG door sill panels to take a seat inside and you're bound to like Recaro-style sports seats that are trimmed in a combination of Artico man-made leather and Dinamica microfiber. Another classy touch sees the five SLS-style dashboard air vents in finished in black and red, plus there's a set of red seatbelts which, as any fool knows, are worth a second a lap. Other stuff we like includes the fact that what looks like metal really is. Not so good are the hard plastics down by the centre armrest and the need for a fiddly electronic handbrake. Seek out cars fitted with the optional three-spoke leather-trimmed flat-bottomed AMG steering wheel with its red contrasting top-stitching. And the lovely alcantara trim and cool-to-the-touch silver gearshift paddles. Through the wheel, you glimpse an equally purposeful instrument cluster, with two main chrome-trimmed dials featuring red needles and separated by a central colour display featuring a race timer mode. Anything the colour display can't tell you can probably be found on what looks like an iPad sitting on the upper part of the centre console but which is in fact an integrated infotainment system, able to sync seamlessly with most smart 'phones. Its placement looks like a bit of an after-thought but the screen itself works very effectively, even if you get a car whose original owner paid extra to have all the COMAND Online Media features integrated into it. As for space in the back, well the curve of the rear side windows and the amount that the rear wheel arches intrude into the door openings mean that getting in isn't quite as easy as it would be in, say, a Golf R or an Audi S3 Sportback. Once installed inside though, even a couple of six-footers should be reasonably comfortable, thanks to the scalloped cut-outs at the back of the front seats. We wouldn't though, put too much store in Mercedes' claim that this is a five seater, a statement which seems to be at odds with the way that the cabin at the back has been styled very much to suggest accommodation for two. Three children will probably be fine though. And the boot? Well once you've managed to lift the heavy tailgate, you'll find that the stylised rear light clusters do necessitate a rather narrow opening, but once you get your stuff inside, you'll find 341-litres with the rear seats up or 1,157-litres with them folded. That's a little less than most rivals offer, but not by enough to matter very much. It is a pity though, that the rear seats don't fold completely. Still, on the plus side, items more than a metre wide can fit between the wheel housings and you do get some extra space beneath the boot floor to keep valuables away from prying eyes. As with any high performance hatch, you really need to try and avoid used examples that have been mercilessly thrashed. The main issue to look out for is gearbox issues. If the car you're looking at has this problem, you'll notice it during gear changes when accelerating hard from cold which will crunch alarmingly from ratio to ratio. One owner we came across had had to have two gearbox replacements because of this issue. Watch out for squealing brakes too, another common bugbear. We came across quite a few complaints about rattling interior trim. And a few poor quality cabin features; apparently, the cup holders break really easily. In one case, an owner found that his driver's door wasn't aligned properly, so metal graunched on metal. Ask if the car you're looking at had the necessary software upgrade too. As usual, check the alloy wheels for scrapes and make sure that servicing has been correctly carried out at a Mercedes main dealer. (approx based on a 2015 A45 excl. VAT) An oil filter is around £21 and a spark plug costs around £16. Front brake pads cost around £163; for a rear set, it's £78-£90. Front brake discs cost around £74-£97 (but a pricier brand set could cost up to £213); for a rear pair, you're looking at around £130. A set of wiper blades cost around £64. A headlamp bulb is in the £4-£21 bracket. So what exactly might the world's most powerful hot hatch be like to drive? First impressions are certainly encouraging: proper race-style instruments, a carbonfibre-trimmed dash and, thank goodness, the awful column-mounted auto gearshifter you'll find on other A-Class models replaced by a proper chrome-trimmed AMG shifter down where it should be, falling nicely to hand at the bottom of the centre console. What's important though, is what lies ahead beneath the bonnet. You can't help firing this Mercedes up with a pleasurable thrill of anticipation, for what's on offer here is quite a feat of engineering. After all, if you want to buy a car from the 2013-era with an engine that provides more horsepower-per-litre than this A45 model's 2.0-litre unit does, you'll have to choose the Mclaren P1 hypercar. In the first few hundred yards, there's nothing especially notable to report, apart from the fact that you're going very quickly indeed. Switch the AMG Drive unit into 'M' for 'Manual' or 'S' for 'Sport', then use the RACE START feature in the AMG SPEEDSHIFT DCT seven-speed dual clutch sports transmission and the 62mph barrier can be demolished in just 4.6s, nearly half a second faster than obvious rivals from this era like the BMW M135i, the Audi S3 and the Volkswagen Golf R. As the revs build, so do the aural fireworks, nearly all of them from behind you rather than from the engine up-front, especially if you've specified an optional sports exhaust that creates a wonderful bark during full-bore upshifts. BMW and Porsche provide richer music from beneath the bonnet but it's not as addictive - or as efficient. So while a BMW M135i needs three litres, two turbos and six cylinders to generate only 315bhp, this Mercedes simply makes cleverer use of the humble 1991cc four-cylinder powerplant found in the brand's ordinary A250 model. Who would have guessed that this engine could be tuned to deliver as much as 360bhp? And 450Nm of torque - more than a Porsche 911 Carrera S. The reasons why lie in the detail. So there are two radiators instead of one, a larger intercooler and a hi-tech variable-vane turbocharger, plus the exhaust system is different and features a 'loud' mode. The car was facelifted in 2015 and given a 381bhp version of this engine. Away from the engine bay, there are meatier fixed-rate dampers and bigger anti-roll bars. The suspension gets firmer springing too, despite which, the ride is actually quite acceptable, better in fact to our mind than that of the standard A-Class. That's provided you don't get a car whose original owner ruined it by specifying the larger 19-inch wheels. Or a car whose original owner was unwise enough to pay extra for the rock hard AMG Performance suspension set-up, to our mind suitable only for track use. As surprising as the ride is the steering, its firmer bushings offering better feedback. It'll be a revelation to those, like us, used to the disconnected PlayStation feel of older AMG models. And the whole recipe's properly finished off with reassuringly huge brakes, a wider track and grippy gumball Dunlop Sport Maxx tyres. Rubber that isn't spun away uselessly through tight corners or during slippery weather. 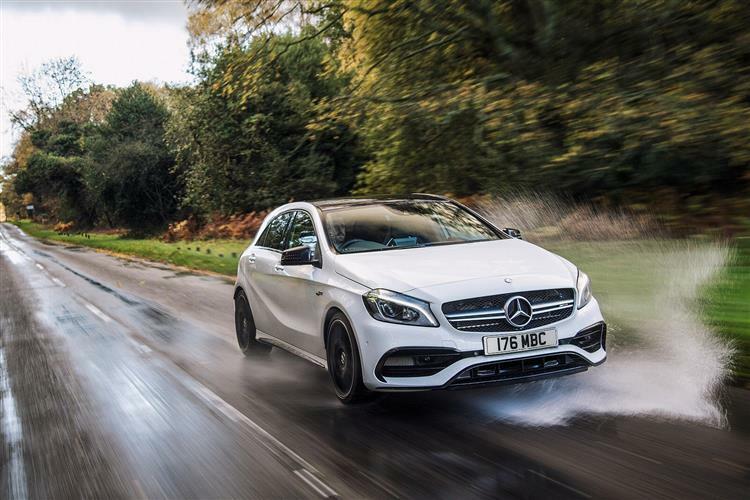 An AMG 4MATIC all-wheel drive system works in front wheel drive most of the time but when needed, directs up to 50 per cent of torque to the rear wheels to ensure a playful bias to the car's handling and guarantee a rapid getaway. And there's a 'Curve Dynamic Assist' system that that lightly brakes the inside front wheel through tight bends, sharpening turn-in and ensuring that all the power gets onto the tarmac. Does it all work? Yes. Will it satisfy absolutely all members of the red mist brigade? Probably not. If you're the kind of person who likes to steer a car with the throttle and want a machine that's fun but occasionally a little frightening, then this one probably won't suit - though you can switch the ESP stability control into 'Sport handling' mode - or off completely - if you really want to satisfy your wild side. Broadly though, this is a car that barrels into corners with the chief aim of coming out from them as quickly and efficiently as possible. Like the old Audi RS3, wet or dry it just grips and goes. And if there's a quicker point-to-point country road choice on sale from this era, then we can't think what it might be. At launch, this was the fastest hot hatch ever made. And the best from its era? That'll depend upon your performance priorities. There may be more rewarding shopping rockets but there aren't any more effective ones. This car represented the distillation of everything Mercedes knew about performance cars back in 2013 into one small, perfectly formed package. It's all there. The hand-built AMG engine. The manic all-weather performance. The class-leading safety. The uniquely up-market interior. 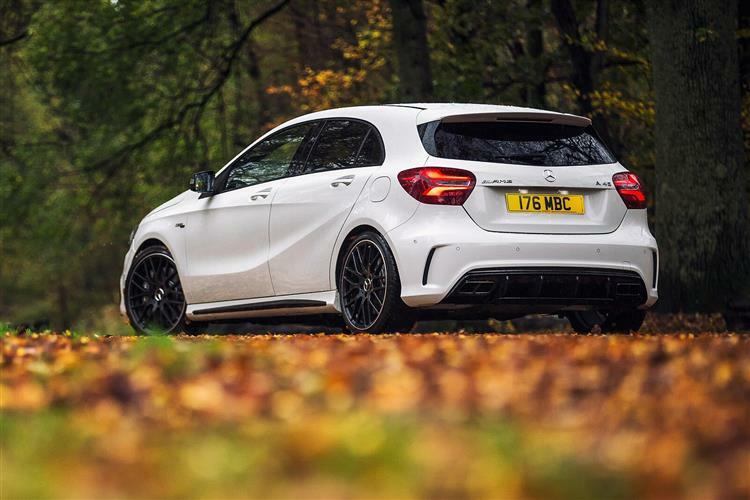 If you've been wondering what the Mercedes of small performance cars might be like, well this A45 provides a devastatingly effective statement of intent.